Spring Tide Holiday Cottage near Cadgwith is a newly refurbished holiday property sleeping up to five in comfort. 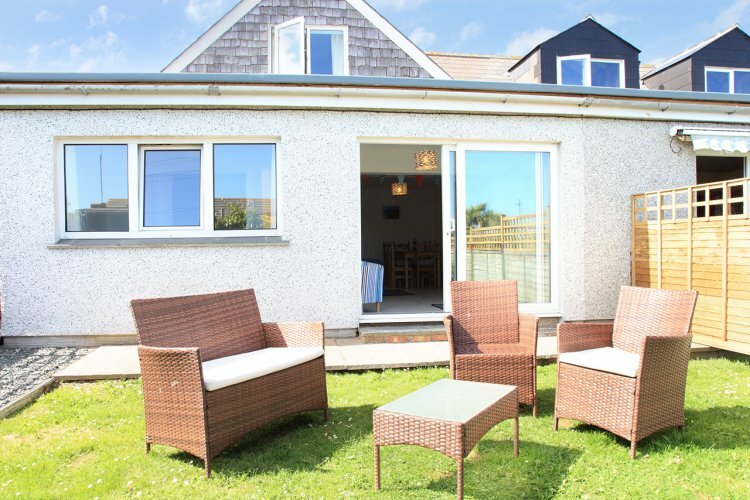 Situated in Ruan, just 10 minutes walk from the sea at Cadgwith Cove, Cornwall. Ruan itself is very convenient with a well-stocked grocery store just down the road, a large recreational park for the kids, a local market on Thursdays and municipal tennis courts. A short walk down to Cadgwith Cove will give you access to the stony beach with the fishing boats pulled up high. The fishmonger sells fish straight off the boat or if you prefer someone else to do the work you can sample the menus at the Cadgwith Cove Inn or the Old Cellars restaurant. Miles of coastal walking are available along the stunning cliff tops of the South West Coastal Path and for the less energetic the beaches of the Lizard Peninsula, including Kynance Cove, are just a short car ride away. Situated in an area of Outstanding Natural Beauty, 'Spring Tide' will give you access to some of the most stunning scenery the National Trust has to offer. The furthest Southerly Point at Lizard is just 10 minutes away by car - or an exhilarating 40 minute coastal walk. Beaches at Kynance Cove, Kennack Sands or Poldhu Cove are all easily accessible and the beautiful Helford River is just 20 minutes away. Further afield you can explore the unspoiled far South West of Cornwall from St Michael's Mount, Penzance, Mousehole, Lamorna and Land's End, or take in the hustle and bustle of the harbour town of St Ives - it's up to you! Spring Tide has its own allocated parking space for one vehicle although more space is often available. The sloping garden path leads to a useful entrance porch for coats and boots and then into the well-equipped kitchen. The lounge/diner is very tastefully decorated and furnished in a bright, beach-hut style. With a table and chairs for six people and comfortable lounge seating for up to five. There are sea glimpses from the double sliding doors that lead out to the sunny sheltered garden with small patio and garden furniture. The main bedroom has a 5' king-size bed, bedside tables and lamps and a small handbasin. A curtained area has a 3' single bed (with further pull-out bed if requested) and a double wardrobe. Family bathroom with matching suite, electric shower over the bath and a heated towel rail. Front bedroom with 4'6'' double bed, bedside tables and lamps and a handbasin. The owner have a bedroom (soundproofed) above. Stargazey is the sister cottage to Spring Tides next door which has its own parking and separate entrance - for an extended family why not rent them together? Central heating, electricity, bedlinen, towels and Wifi are included in the rental. One well- behaved pet is allowed by prior arrangement at £25 per week.